This is the first flash blog event I have taken part in, so thanks go to Diageo, The Whisky Wire and Singleton Whiksy for letting me take part! As with most of my stories with whisky, my first experience of Singleton was when I was going on a trip to Scotland. Just before we were due to go, my travelling companion appeared with an odd shaped bottle that looked as if it had been squashed. We were going to near Dufftown en route to Craigellachie and he thought this would be a good way to toast the health of our journey. I think the best part of half the bottle did not live to see the next day and the other half didn't make it to the end of the trip. That was my only experience of this brand but it left a lasting impression. With that in mind, I'm going to stop wittering and pour a dram. Slainte! Appearance: A vibrant amber with just a hint of red hue. A review of Monkey Shoulder as part of the “Whisky Advent’ countdown to my wedding. A very nice dram that holds its own but would benefit from bottling at a higher ABV. Overall: I really enjoyed this. It reminded me of Ardbeg, which in my book is never a bad thing! This whisky advent could turn out to be an expensive month if all the samples are this good because resisting the temptation to buy a bottle will be difficult. Perhaps the soon-to-be Mrs Cask Blog will give me the stength to resist. Appearance: Deep burnished; It clings to the glass when swirled and has slow, defined legs. This was a very nice dram but to my taste it was a spot on the sweet side to be an everyday tipple. The only way I can describe it is a dessert whisky that I would thoroughly enjoy at the end of a meal as a digestif. The nose was great as was the palate but the taste just didnt match the nose for me. I felt that the nose was something special while the flavours were what I would expect when given a Speyside. This was an absolute treat - sitting outside on one of Northern Ireland's few sunny days, surrounded by my soon-to-be wife and in-laws with a full compliment of delicious drams to sample. This, I admit, was the first time I had been asked to take part in a tweet tasting and the other tweeters are all much more established and learned than myself so I was reasonably nervous before starting. It is amazing how this fine amber nectar can quickly disabuse a person of such hangups. Thanks to Whiskywire, Steve Rush and tweettastings for letting me take part. I hope I was able to add something useful to the conversation. This is an amalgamation, to the best of my ability, of my tweets on each dram. The one thing I will say is that there was not a bad dram in the bunch. I was fortunate enough a couple of days after the tasting to recieve a bottle of the 10 entirely out of the blue. After having tried it, I am very much looking forward to opening it! Appearance: Beautiful light golden/amber colour. Nose: Malty notes up front that reminded me of a mash house; toffee and caramel sweetness with a floral hint - reminiscent of the grass note I get in the Highland Park 10; as the whisky opens up a cinnamon note comes through. Palate: Sweet and crisp bursting with succulent fruit and honey; apple comes through on the palate more so than the nose in place of the floral note; peppery tingle towards the back of the throat which compliments the sweetness perfectly. Finish: Malt and honey that goes on for ages - a delightful dram! Appearance: Very similar gold/amber colour to the 10. Nose: The malt is still prominent but in a more savoury way; I get the apple on the nose in the 12 straight away with the cinnamon adding a spicy kick - cinnamon apple turnover in a glass; sweetness comes through as demerara sugar; as it opens up the 12 reveals its sherry influence in a subtle way - juicy dark fruit is hinted at under the malty brilliance. Palate: The 12 tastes just like the Apple turnover I got on the nose! A crumbly Danish of a dram with Apple and cinnamon. The sweetness lingers at the back of the palate in a honeyed note; credit to @Unchillfilter for this note but there is a hint of the smell of pencil shavings. The 12 has edged out a lead for me over the 10. The palate is absolute sweet perfection and balances beautifully with the exceptional nose. Finish: The finish is a paradox - somehow drying and succulent for a long sweet time. Nose: The 18 has the Malt in the form of grist on the nose but a toffee sweetness is more prominent. The cut grass note is there making the nose very fresh. Cinnamon is in the 18 but the fruit comes through more like a summer fruit salad - berries and chopped apple; as the 18 opens I get marmalade. Palate: The 18 is a spice bomb that develops through a peppery tingle to a chilli burn. The light summer fruits have been very much replaced by dark stone fruit - plums, raisins and red grapes; cinnamon adds to this spicy dram’s wonderfully complex palate. Finish: spice and sweet dance on the tongue for a long finish. Nose: Sherry monster! Dark fruits burst out of the glass and offer something very different. More along the lines of the 18 but punchier given the ABV; Cask strength dram comes heavy with orange peel, dark fruits with the malty cereal notes taking a back seat on the nose. Nutmeg and cinnamon spice to compliment. Palate: The Cask strength without water has a very chewy texture and given the high ABV a good alcohol burn. The sweetness comes through after swallowed. Dark Fruits are hinted at but lost in the burn. Adding water and I think it’ll open up massively; the palate opens with toffee, grape and raisin. Spice tingles the whole tongue. Finish: Deep, dark fruit sweetness accented with lingering spice. Not a bad dram in this bunch but I have to say my favourite was the 12 - I will be adding a bottle to the collection definitely! The walk, we were assured, from Bruichladdich to the nearest pub at which the Sportsman's desire for rugby could be sated was but a stone's throw. No sooner would we have left the distillery than we would be ensconced by a fire with the permitted exception to the rule of Scotch on this trip: a pint of Guinness in honour of St Patrick's Day. This assurance, dear reader, was not worth the air used to form the words. The issues tri-fold: 1) By this point in the day there had been a not inconsiderable drop of the good stuff taken; (2) We had stopped by the unlikely emporium, Debbie's, to collect fire wood to sustain us through another night of howling wind; (3) Said wind was already out in force and making very forthright attempts to blow us into the sea. However, Shackleton, Drake and Magellan have nothing on a group of slightly inebriated Northern Irish chaps and so we set off. Peat Head and myself offered, being the least interested of the group in catching the rugby, to drop the firewood and purchases from the distilleries (my own are pictured above) off to the house as it was only a short detour. This came at a cost of much distress to sheep in a neighbouring field as they assumed Peat Head was carrying a bag of feed and chased us on the other side of a hedge for a not insubstantial portion of the journey. We decided to take respite briefly in the house before taking the extra trek out to the pub (in all honesty it was about a 20-minute walk, but I would be lying to you if I said the thought of a taxi didn't cross my mind and lips). I took solace in a glass of the delectable Dalmore Cigar Malt and Peat Head, for reasons that I fear will never be clear to me, decided to opt for tea. His depravity truly knows no limits. The only part of the journey that I wish to dwell on is the exceptionally creepy abandoned 4x4 that adorned the lane to the house. I will grant you that in this photo it doesn't look that bad but picture the first night we drove up that rickety, single-track lane with nothing but the car's headlights illuminating the seemingly never-ending path. It didn't fill us with much comfort either that we were going the right way or that our car would be able to finish the journey this noble vehicle couldn't. When we met the other two the game was over, and I honestly can't remember what I was told the score was. Sportsman seemed happy so all was good with the world. The bar we were in, if I'm honest, was not somewhere I would normally choose. It was very bare and the kind of place that at home would serve one type of each spirit and a beer on tap. Oh no, not on Islay. Even the smallest and most modest of bars on Islay has an astounding selection of amazing scotch. As this was being rolled in to be a pseudo-stag do for yours truly, I wanted to treat the chaps to a dram. I spied a Black Art behind the counter and enquired how much four of them would be. Suitably chastened, I opted for a Port Charlotte and re-joined them at the table. This is the part where I make a disclaimer. There had been drink taken on this day and, indeed, drink was being taken as the incident happened. However, I was not drunk. I got up to make my way to the bathroom and paid less attention than was required to the intricate floor design, having as it did a dip. A trip, a nearly collapsed table and a split lip later it was over. Do you know what I loved about it? I wasn't hurt and that was obvious so the owner's response was 'Aye, we've heard about your type around here - don't yae be tryin' to sue me!' All in good humour, of course, and he investigated my wellbeing the next time I was at the bar. He even poured me a wee dram of that Black Art that I had asked about earlier to make up for my troubles. That's the kind of compensation I like. Another upside of this delightful little place was it had a curry night on - not traditional local fare but very welcome all the same. We topped the night off in a different bar playing chess, draughts and Islay Monopoly before trudging back to the Black House in the pitch black. Despite having another full day planned ahead, we decided that this was a perfect time for Mario Kart, more whisky and listening to Stevie Ray Vaughn into the wee hours. Nobody faded, but Sportsman and I sat up until around 3. Thankfully, this did not render us useless for the following day. Balvenie has become a recent tipple of choice for me. As you can imagine from the photo above, this was a delightful evening. Soon-to-be Mrs Cask Blog probably regretted the very kind gift of getting me these three drams because I decided that evening (while we watched a movie) was a great time to do the tasting! I finally got an admission from my better half that not all whisky smells the same off the back of these three drams so I call that a success. The Balvenie distillery was built in 1982 and started production 1 May 1983. Despite expansions over the years and increases in production it is still a Distillery that prides itself upon heritage and tradition. They malt their own barley, they employ Coopers and Coppersmiths and grow their own barley on their 1000 acre farm which overlooks the distillery! I had tried the Caribbean Cask before (see here) but this was the first time I had tried the 12 or the 17 and, I must say, I was very impressed. Typically Speyside with the sweetness you would expect with a good helping of spice that keeps things interesting throughout. Nose: The sweetness comes through as caramel and Manuka honey with some tropical fruit notes coming through as it opens up; white peppery spice with oaky hint; slightly 'dusty' - brought a library to mind. Palate: Honey and treacle sweetness develops into a spicy tingle towards the back of the palate; paprika style tingle; When I worked through the others and made it back to the 17 I got a delightful vanilla ice-cream note. Finish: Relatively short but very good. Honeyed sweetness coats the palate and compliments a silky mouthfeel. Palate: Sweetness in the form of honey develops when the spice dissolves away; vanilla still there but more muted; the spice upfront is sharp and provides a pleasing contrast to the sweet notes - the transition between the two is seamless. Finish: Long oaky spice with a hint of sweetness peeking through from time to time. Nose: Cinnamon spice gives way to demerara sweetness; beautifully rich - a phenomenal marriage of sweetness and spice; citric orange comes through with oak and vanilla taking a back seat. Palate: Fruity sweet - like a succulent exotic fruit salad; an oily mouthfeel with the vanilla punching through unexpectedly; spice is present but less pronounced than expected from the nose. Finish: Long and sweet; tannic dry towards the back of the palate after a succulent beginning. Not a bad dram in the pack, but my favourite has to be the rum cask. There is something different about it that just really clicked with me. It reminded me of the Laphroaig 15 in the tropical notes that I don't come across too often but really enjoy! The taxi that picked us up was driven by what I can only describe as one of life’s true characters. Full of stories of the island and willing to answer any and all questions. When it came to the point of paying for the journey he asked what we had been charged on the way out, remonstrated that our previous driver had been 'a crook' and charged us £5 less. We gave him the extra as a tip because he had been so damned amusing! As we were arriving at Bruichladdich we realsied that we were about 40 minutes early. We were going to head to the Laddie Bar and pass some time with a dram but our learned driver had a much better idea. He dropped us at Debbie's - a mini-market that he assured us did very tasty toasties. Walking into Debbie's was an interesting experience. It is a small shop that within its modest square footage seems to service most needs that a person could have. Need alcohol? Debbie's got you. Firewood? Don't insult her! Islay branded t-shirts? Oh, but of course! And then there were the toasties. I was not holding out much hope for the toasties given the fact that they appeared to be being made in the office of a mini-market. How wrong I was! Debbie makes a mean ham and cheese toastie! We sat in an area that was set up to approximate, rather convincingly, a country style livingroom. The Debutante was most exited by the fact that the shop did nice coffee. But we weren't here for coffee. The Bruichladdich Distillery is amazing. It has been bought out, as is the case with nearly all the distilleries on the island by a large company, in this case Remy Cointreau. Having said that, it still feels like a small family run concern. When you arrive, you are greeted by the inimitable Mary McGregor who runs the Laddie Shop. What she doesn't know about whisky is simply not worth knowing and she always makes sure the folks in the shop are well taken care of. Our guide took us around the distillery and I will not bore you with the details of the tour - it really is a 'you had to be there' kind of thing. There is one story that I would like to share. Bruichladdich Distillery had been moth-balled a number of times. There was a small skeleton staff of people who were around to care for the stock that was stored and ageing but there was no distilling. At the turn of the Millennium a man named Mark Reynier was visiting the island to visit the distillery, having not done his homework. Upon arrival, he was greeted with a set of heavily padlocked gates and a lifeless set of buildings. Never a man to be deterred, he called to a caretaker that he saw walking across the yard and pleaded to be allowed in, explaining that he had come a long way to see it and that it would mean the world. The exact language used has been lost to antiquity, but what is recorded is that he was denied entry. The world needs more Mark Reyniers. Instead of putting his tail between his legs and going to lick his wounds at one of the other fine establishments on the island, he started in motion the process that eventually brought the distillery back to life. Calling upon a number of private investors, he turned Bruichladdich into the ’Progressive Hebredian Distiller' that it is today. For this we thank him. If you are reading this with a dram to hand I suggest you raise it to Mr Reynier. I'll wait. I would be lying if I said this didn't stoke a conversation about how great it would be to pack in our jobs and do the same. Should the opportunity arrive I daresay Peathead and myself would be easy to convince, love our jobs as we might. As will become apparent in a future post, the Debutante really did warm to the notion whisky investment. The notion is, of course, much more romantic than the reality would be but a man can dream. I have talked about The Whisky Vault on the blog before. Rex and Daniel run an exceptional whisky tasting channel but they are also taking the bull by the horns and building a distillery! Check out these magnificent bastards here. Kings among men living the dream. Peathead, Sportsman and Debutante - you know where to reach me! As you can see from the headline picture the Distillery has quite the range. They really are the most generous hosts that you could ever hope to meet. I worked my way through 4 of them (the Octomore, The Bere Barley, The Port Charlotte and the Classic Laddie, since you asked) before being treated to a measure of each of the valinch casks. These are the focal point of the shop - two casks fitted with taps that you can fill your own bottle. How could I not? One of the casks is Port Charlotte Heavily Peated and the other is The Laddie unpeated. I went for the Laddie but it was close...there was nearly one of each! Had it not been for the fact that there was a small bottle of 1992 Black Art on sale, there certainly would have been! The light floral notes on the Classic Laddie are something special that I have become a spot obsessed with recently. All of these are dialled up to 11 in the valinch! On that, if you haven't had the pleasure of trying the Black Art, you must! Mary was good enough to pour me a dram (quietly) when I said I wanted the bottle. Heaven on earth. There is a notably clear bottle on the far left of the top picture that can't go unmentioned. The Botanist is the gin made by Bruichladdich and a damned nice gin it is. They use locally foraged botanicals, which gives a really clean and unique flavour profile but I want to introduce you to a very special individual who is responsible for the entire run of The Botanist. Ladies and Gentlemen, I give you...Ugly Betty! It will not have escaped anyone's notice that gin has exploded recently and this is a very good way for a distillery to ride through those tricky years when there is new make spirit making the journey to being whisky - a time which otherwise could see a new distillery go through a three-year period not being able to bottle anything of their own distillation. Gin is quick to make and doesn't need to be aged. Despite this, I do argue that gin drinkers are becoming worse than scotch drinkers - goblet glasses, appropriate garnish, bitters, often enough fruit to populate a garden and enough ice to sink the titanic. The soon-to-be-Mrs Cask Blog and Mother Cask Blog will kill me for writing this. Wish me luck. The tasting ended and it was time for us to leave. The day wasn't over, but I'll leave the rest of it for another post. The Balvenie is a malt that I first encountered as a gift. My parents, knowing their son all too well, appeared back from a holiday with a bottle of whisky for me from duty free. As they were returning from some sun-soaked region of the Caribbean and I had been suffered through the rigours of a Northern Irish January, they had decided that a dram would lift the spirits. Indeed, it did. The location of their holiday seemed fitting to me, given the bottle that returned - it was a rum cask finish, which I had never come across. I would love to be able to give notes on it, but sadly that bottle predeceased this blog’s birth by a number of years. Another bottle will be procured for tasting purposes; never say I don't do anything for my readers. What I can remember of it was the beautiful sweetness that the cask finish had added - a sweetness like no other I've discovered since. Trip down memory lane over, I was delighted to see this included in the dram club this month. Despite that stunning bottle, my foray into The Balvenie began and ended with it. At the time I didn't have a very big collection or a particularly refined palate and generally defaulted to Macallan because I knew I liked it. This lacuna has since been remedied to some extent but Balvenie was forgotten. Well, no more - my two experiences have been great! So, Peat Week is literally just that - a week in the year in which Balvenie made peated whisky. It is interesting to note that the 2002 vintage was the inaugural run and ever since the distillery has dedicated one week of the year to the pursuit of peat. For those interested, the barley used is peated to 30PPM. The distillery takes heritage and craftsmanship to a whole new level. They still grow and malt a proportion of their own barley, which is rare but not unique. What has struck me as being somewhat unique is that they have their own coppersmiths and coopers on site. The dedication to what Balvenie have called the Five Rare Crafts of Whisky Making is heartening to see in an increasingly mechanised age. Nose: Treacle sweetness masks a wisp of peat smoke; there is a spice note that comes close to, but never reaches the intensity of, clove; pepper; oaky vanilla becomes more apparent when a drop of water is added; citrus notes come and go. Palate: Sugary sweetness is reminiscent of caramel or nougat; smoke is again secondary to the sweetness and is noticeable on the back of the palate; the peppery spice follows through from the nose with a tingle on the tongue; the vanilla is there, but very subtle. Finish: Long and sweet with a spicy tingle on the roof of the mouth. A bottle of Balvenie Peat Week will be joining the ranks in my collection - it is everything I love about Speyside mixed with the peaty goodness of Islay. As I have mentioned Islay is many things; beautiful, enchanting, bewitching, enthralling and intoxicating to barely scratch the surface. Indeed, the last one serves a double purpose. As much as I find myself figuratively intoxicated by the splendour of the scenery, flora, fauna and wildlife, I inevitably find myself literally (albeit responsibly and moderately) intoxicated on the sweet amber nectar that is the famed produce of the island. Given that the Caol Ila Distillery was around a 25-minute drive from The Black House this posed a problem. Tempted though we might have been, we didn't bully anyone into driving and instead got online in search of cabs. For a small island, they really are well serviced in this department, most offering whisky day tours where the driver will ferry you from pillar to post and, presumably, listen to the more nonsensical ramblings that multiple distillery tours in one day are bound to elicit. This will definitely be my plan for the next visit - all the distilleries in one day? Challenge accepted! Who is with me? 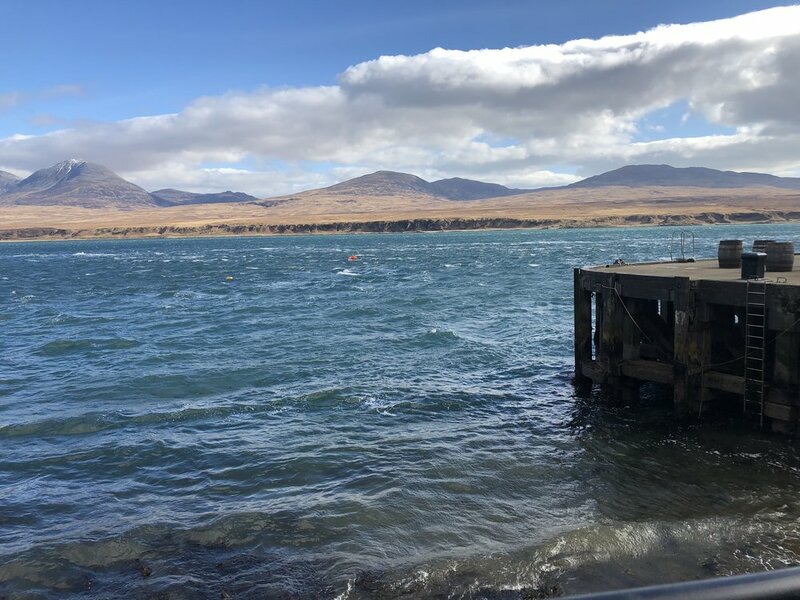 The first thing you notice about Caol Ila is the stunning surroundings and picturesque view of Jura. It is only when you visit you can get a feel for the impact the landscape has had on production here. Whereas now lorries, trucks and vans have made transport much easier, there was a time when everything had to be brought in and out of the distillery by boat given the remote location and uncompromising terrain (for more on this, see my review of the Hepburn's Choice bottling of Caol Ila.) We even have it on reasonable authority from the very friendly folks in the Distillery shop that on a good day you can see some intrepid deer attempting to swim the short distance across the Sound of Islay. As an aside, it is interesting to note that the name 'Caol Ila' is simply the Gaelic for "Sound of Islay.' I say interesting: I find it interesting and hope you share my passion for minutiae. Now, our arrival was not without controversy. I had put the tasting in my calendar for 11:30, a sensible enough thing to given that the email I had received informed me that this was the time we were required. Through some miscommunication between website and Distillery scheduling, the tour was actually due to start at 11:15. Apart from the pages of this blog, few of you know enough about me to know how much I detest being late. Suffice it to say, I sincerely don’t like it. However, it is a testament to the calming pace of this Island that I was immediately put at ease when we arrived. Rather than refusing us entry, starting without us or even giving us a judgemental glare the guide had taken our tasting companions who were on time for a wander about the still house to await our arrival. Long story short, we arrived and were ushered to the tasting room by Nigel, our learned guide, along with our forgiving co-tasters. The group of gentlemen who were also on the tasting were on the best work field trip ever. They were geologists undertaking study in Islay who had arrived a few days early to sample the, shall we say, culture. Where we were fortunate enough to locate Andy of Briuichladdich taxis, they had in fact managed to convince one of their number to drive. Through the entire time we were there not a drop passed his lips and at the end he dutifully decanted the remains into small pots that he reliably informed us would not see the light of the next day. This type of will power surely makes him a god among men. Our own Debutante, this being his first foray into the peaty underbelly of Scotch, did remarkably well. The little that was left in his glasses at the end were potted and brought, which was a positive and heartening sign that the rest of the trip was not going to be his own personal hell on earth. Caol Ila is not a bottle immediately familiar to everyone which seems surprising given that they have a considerable output each year. It would also come as a surprise that a considerable number of whisky drinkers will have had it at some time without knowing. This is because the majority of their run is used in blends, lending its smoky intensity to some of the most famous including Johnnie Walker. It really is a shame that it is not more widely available as a whisky in its own right, because they really do make a damned good dram! After our thoroughly enjoyable time at Caol Ila it was time to get our cab back to Bruichladdich. The Sportsman was starting to twitch with anticipation of the rugby that would be starting sometime during our next tour and we had promised to make every effort to find a bar to watch it. However, with their customary grace and generosity, there were drams poured in the gift shop for those who wanted them (it will come as no surprise that I partook). On a previous trip to the Distillery I had been told that the Moch, one of the whiskies in the tasting line-up, was a good breakfast whisky. I've said it before, and I'll say it again: I could get on board with that logic. Given that we had scarcely passed midday and had sampled five drams it was the kind of reasoning that was to prevail for the rest of the trip. Islay is a special place. This was my third trip to the island and it always gives me the same feeling of stepping back in time. Of the many things bottled there, I wish it were possible to distil the feeling of tranquillity that comes about when you descend the ramp of the CalMac ferry and drive through some of the most beautiful, rugged scenery imaginable. Alas, until such a thing becomes possible I will have to cajole, coax and con my friends and loved ones into travelling with me. Come to think of it, I'm happy enough with that. Oh, and one more thing. The image above is not an Islay whisky. I know that; you know that. Trust me - in context it makes sense. This trip, as with my other Scotch trips, was arranged ad hoc. A WhatsApp group, a suggestion, three very enthusiastic friends and we were done. Two of the group represented polar ends of the spectrum with regards to feelings on peaty whisky - we had a self-professed peathead with a penchant for Laphroaig and a peat-dilettante who had merely dabbled in the smoky realm but was yet to be convinced of its magnificence. I have travelled with peathead (as he shall henceforth be known) to Islay before, and it was with something approaching religious fervour that he insisted Laphroaig was on our list. We were happy to oblige. Now, the journey from Northern Ireland to Islay is an interesting one. You can take a small passenger ferry from Ballycastle which is a very civilised affair taking somewhere south of 2 hours. This was not an option for us as one of our number lives in London and was meeting us in Glasgow. The journey, therefore, started at 6am to catch the 7:30 Ferry to Cairnryan. I am not going to bore you with a detailed account of the journey and offer, instead, this synopsis. Beautiful scenery, amazing roads and increasingly barmy conversations. One part of the journey that deserves mention and that is the final 20 minutes. Have you ever tried to find a house that is painted black, on a pitch-dark evening in an extremely remote area of a remote island? I hadn't but, let me tell you, it presents a considerable challenge. After mistakenly driving up a neighbour's driveway (said neighbour spent the duration of our trespass looking out the window with a glass of wine in hand and understandable scowl on face) and navigating the most potholed road I have ever encountered, the journey came to an end. At 9:30 that evening we arrived at The Black House in Bruichladdich after an exhausting day of travel. I promised earlier that the image for this post would make sense, and I intend to deliver on that promise. Given that we had our peat-debutante with us I had decided that it would be a kindness to bring some non-peated whisky to ease him into the transition. Glasses were duly poured, emptied and refilled through a very amusing game of Cards Against Humanity. The eagle-eyed reader may have noticed that there were four of us, yet only three glasses in the photo above. The final of our quartet had, perish the thought, opted for a beer upon arrival. Beer. On Islay. Maddness. A fourth glass was eventually filled, sanity was restored and we reached our quorum. Never before has a game been so hard fought - room allocation was at stake! There were two king bed rooms and two bunk bed rooms. Yours truly, being the charming a delightful individual you have come to know, came third (after having amassed a significant early lead, so my virtue may still be in question). At the end of the night, the bunk bed was calling. The wind howled through the building and we were somewhat afraid that we might wake up in Oz, but our trusty Air BnB remained firmly rooted to terra firma. The most annoying thing about the wind was that we were unable to break out the cigars that had been brought to try alongside the Dalmore. To be continued...and it will be Islay whisky from this point on! So, for those of you who had been following my postings, you can't have helped noticing that they stopped. I won't lie to you, I have no good reason for this whatsoever. I could wax lyrical about the vicissitudes of everyday life, the overwhelming demand for my oh-so-precious time or the paucity of worthy topics to write about. I could weave you a tale of my time as a humble Emu-rancher in the Australian outback or the time I dedicate to all the worthy charitable endeavours that are no doubt deserving of it. But I won't lie to you. Instead, I'll come clean and admit that I got lazy. For this I beg of you 1000 of your finest copper-bottomed pardons. For those of you who didn't notice the downtime, sorry for wasting your time with the last paragraph. OK - apologies out of the way. This blog started in a most haphazard manner on an afternoon because I was bored and had a dram in my hand. If you are reading this, I'm hoping you are the type of person who reads 'afternoon' and 'dram in my hand' as a perfectly everyday statement (I didn't say first thing in the morning!) If not, this may not be the blog for you. In my defence, I remember it as late afternoon. As with anything started on a whim, its future was a tenuous concept at best. Having said that, here I am again. I find myself back at the keyboard and wanting to bring some semblance of order to this otherwise chaotic endeavour. I have decided that Friday is a great day for a whisk(e)y post. You're easing into the weekend, shaking off the dust of work and getting ready to put your feet up with a dram. I am aware that I have made myself sound probably double my age but anyone with a passion for this marvellous spirit to which we find ourselves inexorably drawn you will understand. This Friday I will be starting to write about a recent trip I took to Islay. I promise this will appear and be followed every Friday by another post of some type, be it tasting, cocktail or travel. If you have forgiven me, I will see you then. If not, call by anyway. It was a hell of a trip and you might just enjoy yourself. As a liquid amuse-bouche I have included the photo of my haul from that trip which will give you a good idea of the route we took. Glenfarclas is a well-established name in whisky. Indeed, the distillery is currently in the able hands of the fifth and sixth generations of the Grant family. John Grant, better known for cattle breeding at the time, purchased the distillery and surrounding farm in 1865 for just north of £500 and the rest, as they say is history. Curiously enough these Grant's have had a preponderance of Johns and Georges. With water; A fruity sweetness came through that wasn’t there before; it reminded me of a fruit tart just out of the oven given the interplay between the malt and fruit. Palate: Without water: I didn't get a lot off this dram without the addition of water simply due to the high alcohol content; there was some hint of dark dried fruit and a whisper of sweetness trying to come through but they were overwhelmed. With water; The raisin comes through in a definite and strong manner; deep and spicy in character with the honey sweetness coming through following from the nose. At first I didn't really know what to make of this dram but, with the addition of water it really came into its own. One to savour for an evening but definitely worth the effort to get to grips with it. It is not what I would call a typical Speyside, but I think that is what makes it interesting. You get the sweet notes but there is the added spice to keep things interesting until your Copita is empty. I’m aware we are nearly halfway through September and this is the last in August's box. The lapse in posts has been down to a mix of work and a diet. Trust me, if it were my choice and I had a better metabolism I would be posting every day! Anyway, on with the show! That Boutique-y Whisky Company - creators of some of the most inventive labelling I have ever experienced. Cartoon graphic labels created by Emily Chappell are individual to each bottling and contain distillery information and industry in-jokes. A bottle from TBWC really does add a certain contrast on your shelf - I recently bought a bottle of the Longmorn 25-Year-Old and am just waiting for a suitable occasion to open it. Nose: Toffee sweetness from an earthy cut grass note; oaky vanilla with a light hint of clove. The notes say marmalade which is a note I have never previously picked up. I got a jar from the cupboard and with the two side by side I absolutely get it! Taste: The woody dryness is offset by caramel sweetness in a typically Speyside manner. Finish: Sweet malted biscuits for a reasonably short time. I really enjoyed this and am now really keen to try more of the range. Being such a fan of Macallan, I would love to try the 30-Year-Old bottle, but 1) it is nearly £600 (which is still good value for a 30YO Macallan) and (2) it appears to be sold out. Note to That Boutique-y Whisky Company: please do another Macallan! So I have an admission to make - I don't speak Swedish. There, I said it. I understand if you are done with this blog and feel you would rather not waste your time with a mono-lingual moron. If you are still here, I appreciate your forgiveness and will endeavor to never let you down again. Nose: Vanilla with a hint of citrus orange; very light smoke covers a fruity sweetness; milk chocolate. Finish: A sweet chocolaty finish; reasonably long with very limited showing of the peat smoke. The best part of this dram for me was the nose - the delicate wisp of the peat smoke floating over the fruit was very pleasing. An all-round nice dram that was much more accessible after the addition of a drop of water. I've written about Indian whisky before. I said then that India is not one of the countries that springs to mind when we think of whisky but it seems like it may be only a matter of time before this is no longer true. I have been getting my eyes opened to a whole new world of distilleries and John Distillery is one that I am particularly interested in. The Great Indian Single Malt, as it is known, is created in Goa. The climate there is a tad different from the Highlands of Scotland and this plays a distinct role in the maturation of the whisky. The angels in India are much greedier than in the UK, taking a share of up to 8% per year! The Distillery was established in 1992 but has sought the input of experts from far and wide to create their expressions. The copper pot stills were installed by experts from the UK to ensure traditional processes were at the core of the spirit. Peat used at the distillery is imported from Scotland but the barley used is from the foothills of Himalayas. It was this final fact that made me so intrigued to try the Paul John. The Master Distiller for John Distillery is Michael D'Souza, who has more than 20 years’ experience working with spirits and I love his approach - he sees whisky manufacturing as equal parts science and art. I want anybody who works in the whisky industry making anything that I'd like to drink to have this passion. Science has its place, of course it does, but I don't want my dram to be crafted by a machine. Great whisky is every bit as artistic as the best of the Great Masters and requires the guiding hand of an artist kept in check by the odd test tube. Appearance: Amber. The Paul John website has a beautiful description - 'Its sparkling hues are reminiscent of sun-kissed beaches'. Nose: Sweet malt with candied orange peel; honey and vanilla. The sweetness is like a dessert. The malt smell reminded me of the smell of a distillery that is producing - the first distillery I ever visited was Edradour and this smell took me back to that visit. Whisky Exchange describes it as a 'delicate gristiness' which sums it up very well. Finish: The spicy tingle continues with malted sweetness fading out over a long time. Nose: Peat smoke is most notable but complemented by a fruity sweetness. Taste: Honey at first, which was surprising given the smoke on the nose, but then peppery smoke billows in. The dry smoke builds before subsiding to leave a spicy tingle in the most pleasing way. Nose: The malt of the Brilliance is back but in a more understated way. Slightly fermented apple; nougat sweetness with a hint of spice that is reminiscent of nutmeg or cinnamon. Taste: Interestingly the malt comes through stronger than the Brilliance, as does the spicy tingle. Honey sweetness keeps the spice in check with a burnt toffee sensation peeking through at the end. Nose: A whisper of peat smoke is interesting, hiding within it a slight medicinal quality. The malt that I have come to expect from the Paul John is there but this time complemented with the most wonderful chocolate covered coffee bean aroma. Taste: The peat is beautifully delicate and towards the front; malted sweetness edging towards demerara sugar; the official notes say mint - I think I finally get what this means but it is more of a sensation than a taste for me. Finish: Malted gristiness (thank you Whisky Exchange) lingers with an amazingly delicate peat smoke that maintains throughout. A big fan of this dram and especially the finish! Taste: Salty earthy sweetness (bear with me; I know that contradicts itself). The sweetness is provided by cane sugar flavours with the earthy quality coming from fresh cut peat. There is a salty tang towards the back of the throat that is unusual and pleasant. Tingly spice returns on the tongue. Finish: Peat smoke lasts for a very long time with just a hint of honey sweetness fading out behind it. 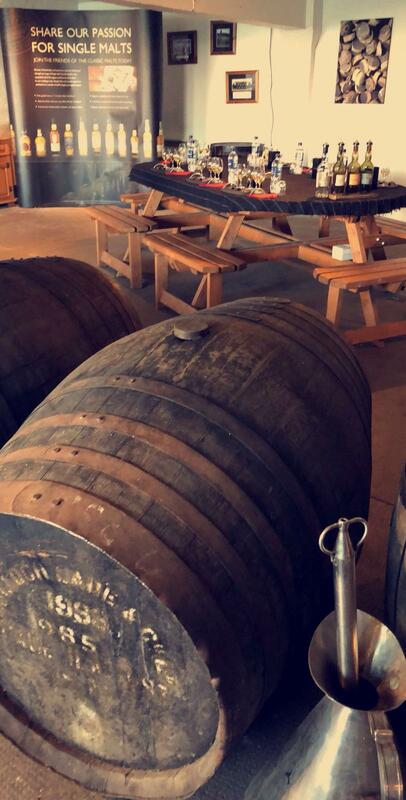 This is a distillery that has a lot to give. Every one of the drams above is notable but my favourite without a doubt was the Edited. The light peat is a nice touch that interplays with all the other flavours in such a perfect balance that it really is something special. So much so, it is making it onto my wish list! Notable mention must go to the Peated Select Cask for packing such a punch with the smoke that it reminded me of Islay's big 3! So, to paraphrase Paul John's own request, go take a sip of the soul of India. The Tomintoul distillery lies in the Speyside region of Scotland near its namesake town which holds the honour of highest village in the Highlands of Scotland. I enjoyed this fact, but nowhere near as much as their other claim to fame: in 2009 they held a Guinness World Record for creating the largest bottle of single malt Scotch whisky! The bottle was a stunning 105.3 litres of Tomintoul 14-Year-Old that would serve around 5,250 drams. That sounds like one hell of an evening to me. The distillery nestles in the gateway to Cairngorms National Park in the Glenlivet Estate and any search for photos of the surrounding area show it to be outstandingly beautiful. As it happens the area is home to a number of endangered and protected animals including the golden eagle, mountain hare, wild cat and black grouse. The distillery mascot, Vincent the pheasant, can often be found leading a flock of his friends when the grain trucks appear for a free meal (mooch!). It seems that Tomintoul's name as 'the gentle dram' extends beyond its smooth taste. They have put great stress upon the unspoilt natural environment in which they work, claiming that it can be tasted in every dram. Nose: Plum/Raisin notes are prominent from the portwood finish; a pleasing hint of cinnamon offset by toffee sweetness; oaky vanilla with a slight hint of tobacco on occasion; notes of red wine. Taste: Classic Speyside butterscotch sweetness on the back of the palate come out from behind the drying tannin up front; a pleasing spicy tingle builds, but is not overpowering. Finish: Spicy dried fruits with a lingering buttery sweetness. This is a great dram that interestingly hits all the Speyside notes (sweet, light and fragrant) with a stunning uniqueness in the form of the portwood finish to make it special. It has made me keen to try more from this distillery and it has definitely put it on the map for my next trip around the Highlands!